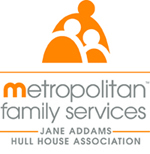 Like Jane Addams and Hull House, Metropolitan Family Services is committed to improving the future of our communities and hundreds of thousands of Chicago-area families. Metropolitan provides programs for every family member and advocates policies that protect and defend people’s right to live as a family, safe and secure, with hope for a brighter future. Honor Addams’ legacy and support the work of Metropolitan Family Services by giving a secure gift online today.